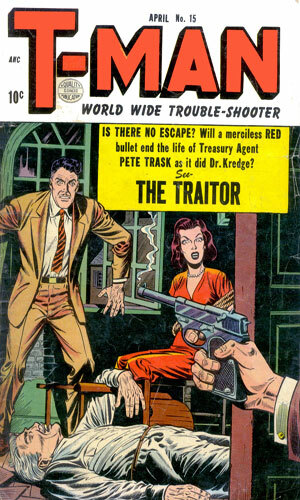 Pete Trask is an agent with the U.S. Treasury. He is a T-Man, the sobriquet given to that department's men in the field to mirror the G-Man label the FBI agents were called. It is a nickname that is used extensively throughout the many recorded adventures of this intrepid globe-trotting government man. Despite having so many tales of derring-do and crazy escapades, we learn very little about the history of Trask. We have no idea where he comes from or how or when he became a Treasury agent. But the stories are replete with information about the man that he has become. Trask is in his early-to-mid 30s based on his looks as well as the history that is alluded to in his statements and those he deals with. He has been doing this international cop routine for quite a while and so the operating in a foreign land is second nature to him and he is totally comfortable with it no matter where he is sent. He is in terrific shape, depicted numerous times without a shirt or with one ripped from his body by all manner of nasty implements. Shirtless he shows he has virtually no flab and his muscles are sinewy and ready for actions. He does smoke, something that was extremely common back then, but he is seen without a cigarette far more than with so it has likely not yet taken its toll on his stamina and lungs. Trask is most definitely a ladies' man. He so very much appreciates the female side of the species and they without a doubt like him back. He is constantly finding attractive women to help out in an assignment or be there when the case is wrapped up to help him celebrate victory. He also loves to charm those lovelies who are not on the side of the angels but he is not so foolishly chivalrous as to let them stab or shoot or poison him as they are always eventually trying to do when they learn he has tricked them. His conversation runs on the side of the patronizing, again as was common back then, with a whole lot of 'doll' and 'honey' and 'sweetie' and the like. Luckily we can tell by his actions that he is not as much of a pig as his words might indicate - he has his backside saved too many times to not know how capable they can be, not to mention almost being perforated in anger by the bad ones. Trask gets around the world a whole lot and seems to enjoy it but he also loves his vacations and gets downright snooty when they are cut short by a case or two, something that happens a lot. But his desire for rest and recreation (more the latter) will push him to solve the offending mystery so he can get back to it. 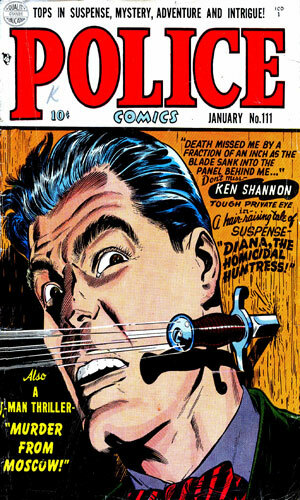 Quality Comics, which later became Fox Feature Syndicate and whose characters were even later purchased by DC Comics, had an impressive run of original characters, several of which remain to date and a couple of which have achieved cult hero status. 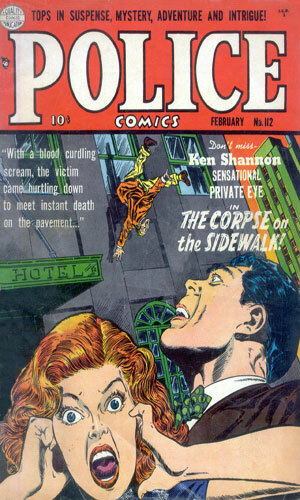 One of Quality's premiere magazines was Police Comics, an interesting name since its first issue might have dealt with crime fighting but the presence of actual police is tangential at best. 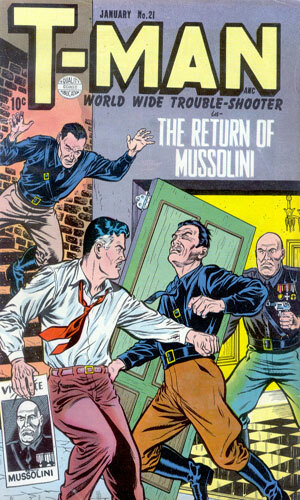 Issue #1, released in August, 1941, introduced a slew of new characters as the comic was throughout its life an anthology. Several of these newcomers came and went quickly, as was not uncommon, but a couple would prove very long-lasting. 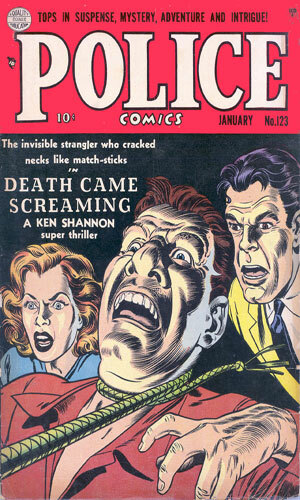 Plastic Man and the Phantom Lady made their debut in the pages of this first issue and would remain for some time. 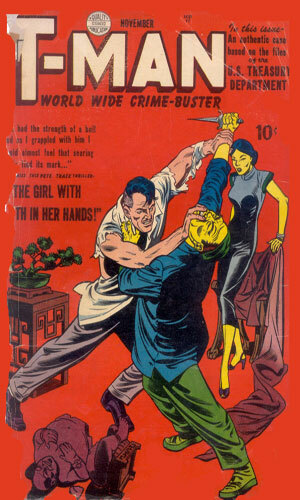 Phantom Lady would remain with the magazine for 23 issues before going off on her own way including getting her own title. 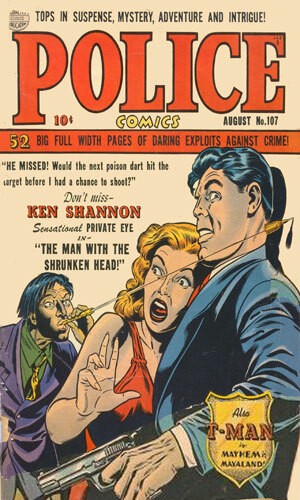 Plastic Man would also get his own magazine as time went along but he still stuck with Police Comics as well. 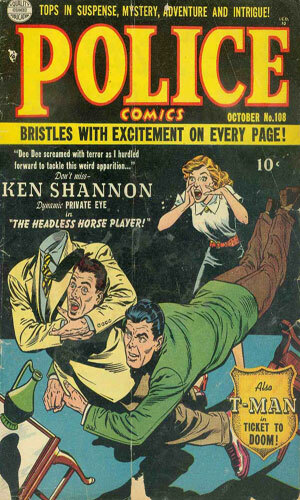 Towards the end of 1950, though, change was coming to Quality Comics, as it was to the whole industry, and superheroes were disappearing quickly. The big guys like Batman and Superman would stick around but many of the anthology mags would gradually reduce the men-in-tights stories and going to men-in-fedoras. 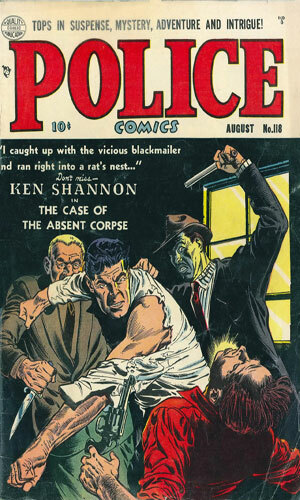 For Police Comics, the change took place with issue #103 (Dec. 1950) and it was abrupt. 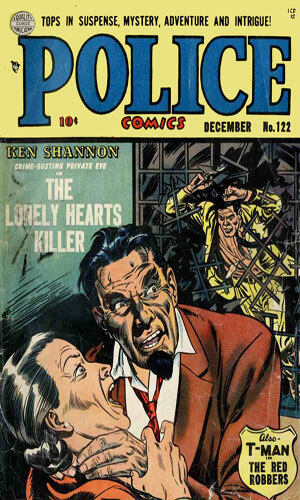 #102 had two Plastic Man stories and one The Spirit story, along with a cop story and a couple of smaller pieces. The next issue, coming out two months later, had no superhero in it and had totally changed the direction of the magazine, a direction which would remain for the remaining two dozen issues. 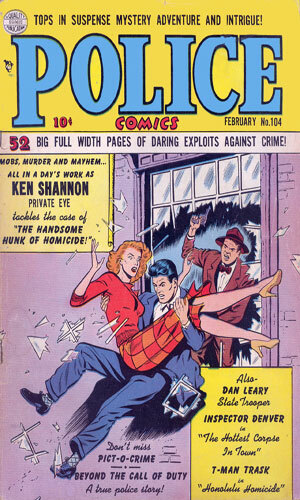 The star of the revised Police Comics was a "rough, touch, and rugged Private Eye" named Ken Shannon. 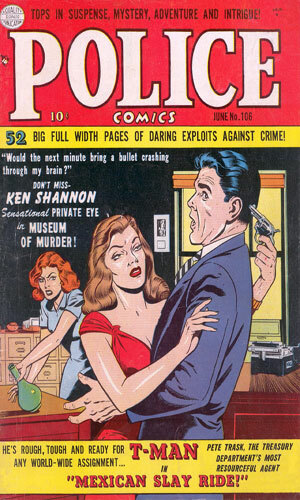 He was most definitely in the Mike Hammer / Michael Shayne / Sam Spade ilk and would be popular enough to not only grace the pages of this magazine but would also get his own title as well. And showing up in that initial revised edition was "Treasury Agent Trask". 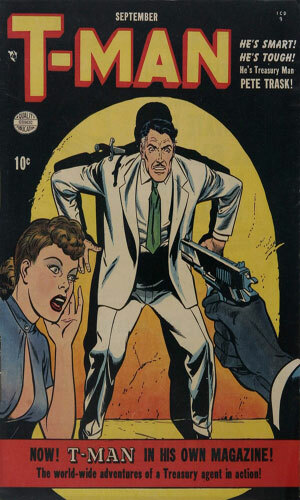 That was the only time he was titled as such for the next issue would refer to him as "T-Man Trask" and from then on, if he were mentioned on the title page (he usually was not), he was identified just as "T-Man". 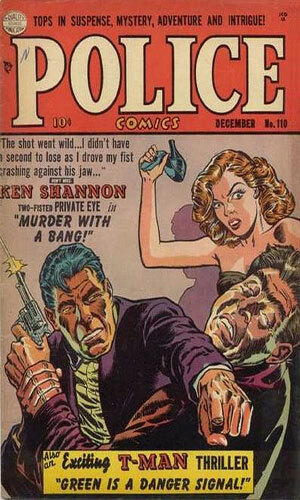 Both Trask and Shannon would remain with Police Comics for the 26 more issues it would last. 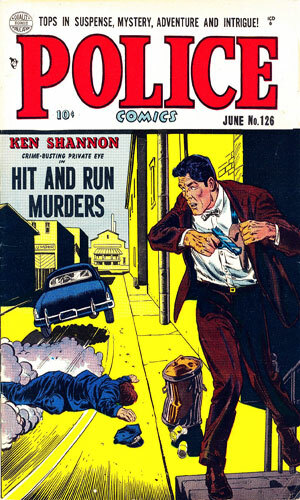 They would also both get their own magazine starting the next Fall (1951) with the solo title coming out every two months and Police Comics coming out monthly. Since each story was totally stand-alone, there was no problem with continuity. 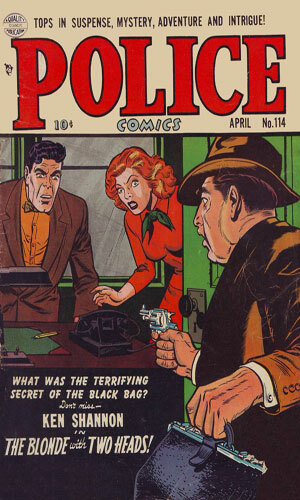 When Police Comics came to an end in October, 1953, the T-Man comic would continue. It ran every two month for a while then switch to monthly in October, 1954. 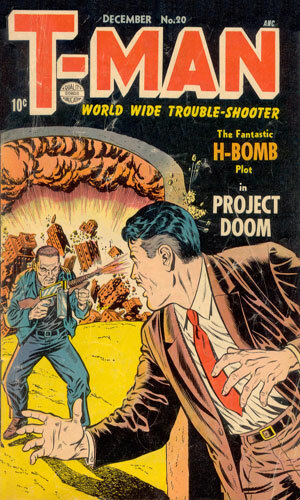 T-Man came to an end in December, 1956 but it really had stopped with original stories a year earlier. 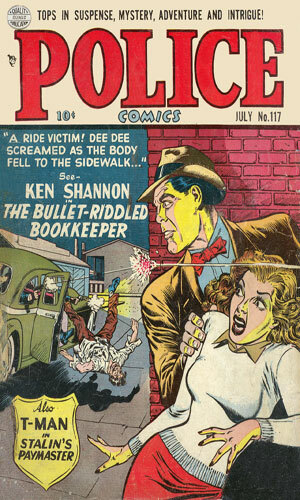 Issue #28 (October 1955) was the first issue to have repeats of stories originally printed in much earlier Police Comics issues. There were still 3 "T-Man" tales in it but they were all repeats. 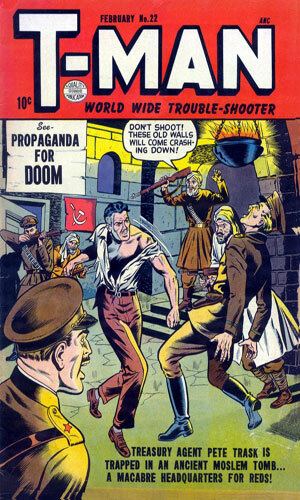 The same for issues #29-38 although the number of stories would vary with addition non-T-Man tales as filler. 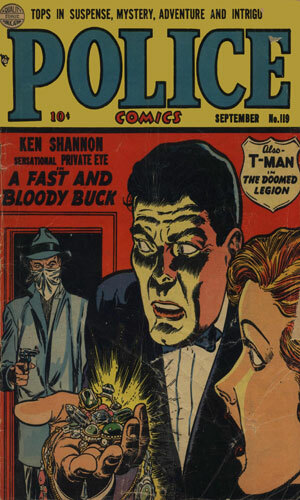 So, it was really with T-Man #27 (September 1955) that the last tales of Pete Trask, T-Man, were told. 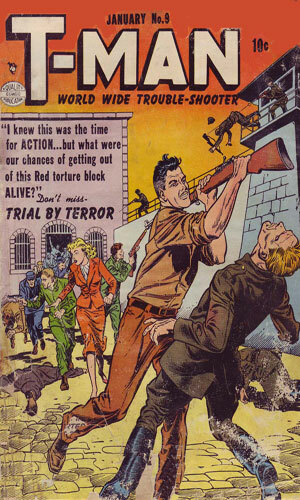 1953 - Magazine Management produced a 4-issue series for T-Man World-Wide Trouble Shooter!, each issue likely containing three tales. 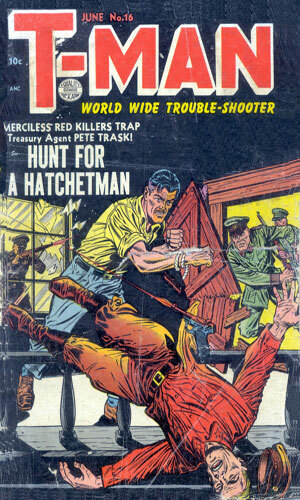 1957 - Horwitz Publications came out with a one-shot T-Man issue with 2 T-Man tales along with others. 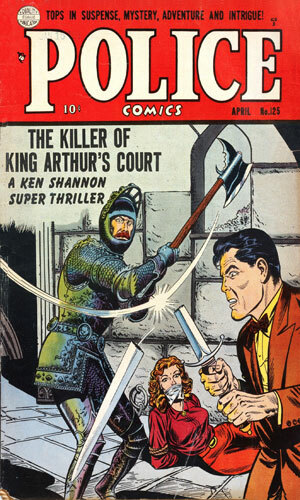 1959 - Archer Press, Ltd. in England had a 6-issue series of reprints of T-Man. 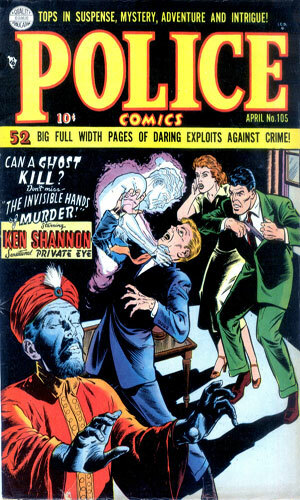 1961 - L. Miller and Son had an anthology series of reprints called Voodoo in which issue #9 told three T-Man tales. 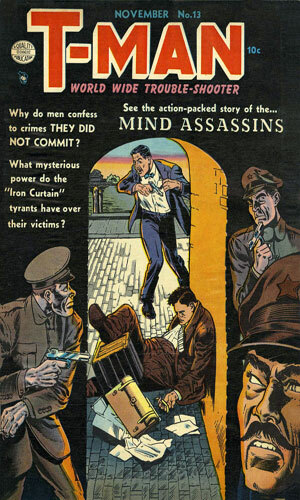 1999 - AC Comics had a Men of Mystery anthology series showcasing many tales from earlier decades. 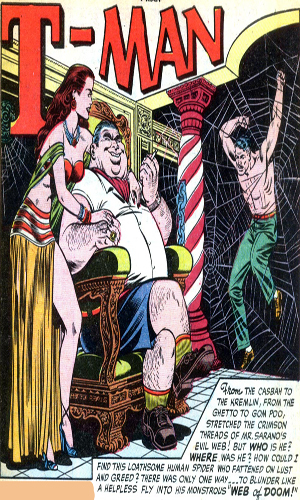 At least 7 of these issues had a T-Man story in it. 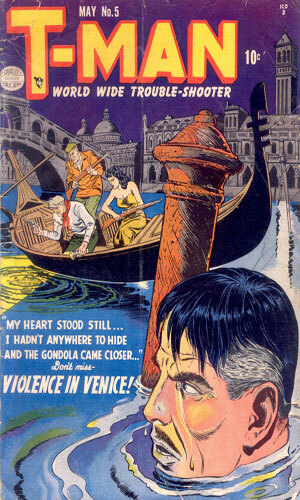 2002 - AC Comics released a series of anthology comics called Golden Age Greats Spotlight, issue #2 of which had one tale. When Quality Comics went out of business, powerhouse DC Comics purchased the rights to some (or all) of the properties. If it snatched up Pete Trask, T-Man, it has not yet chosen to do anything with him. 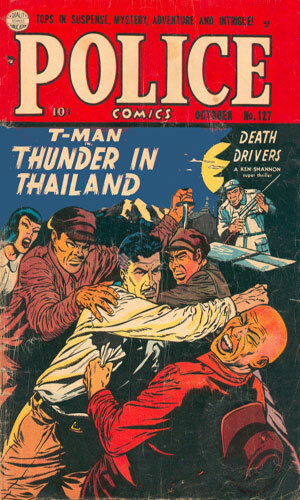 From Police Comics #103 - T-Man Pete Trask heads to Thailand to recover counterfeit plates he had hidden in a temple to keep them from being used. The engraver and accomplices want him to lead the way. 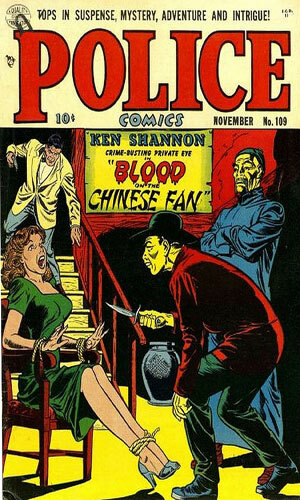 From Police Comics #104 - Another counterfeit case for T-man Pete Trask - this one starts with a capture of an engraver in Hong Kong and ends up in Hawaii and a lot of flying lead. 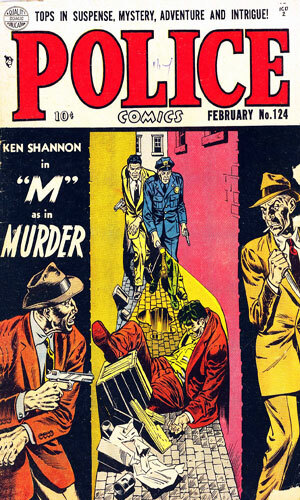 From Police Comics #105 - The death of a small time hustler in post-War Berlin puts T-Man Trask on the trail of a counterfeiting ring there. 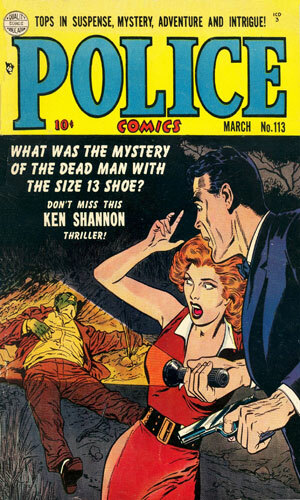 From Police Comics #106 - A rocket has gone missing in Mexico and it falls to T-Man Pete Trask to find it and retrieve a small item from its nose cone. 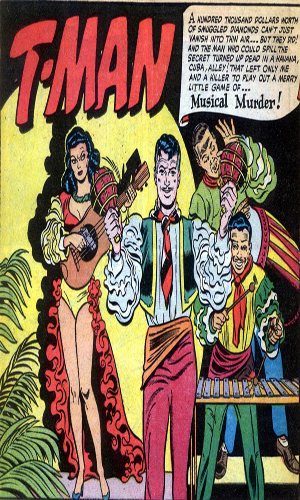 From Police Comics #107 - Smuggling is what brings T-Man Trask to the small Central American nation and he finds a pair who sneak refugee money into the US and have a nice sideline with stolen Mayan gems and trinkets. 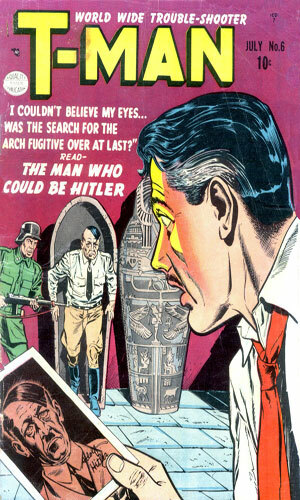 T-Man Comics #1 - lead story - On vacation in Rome, T-Man Trask has a tooth issue which takes him to a dentist and lands him in the middle of a communist spy smuggling case. 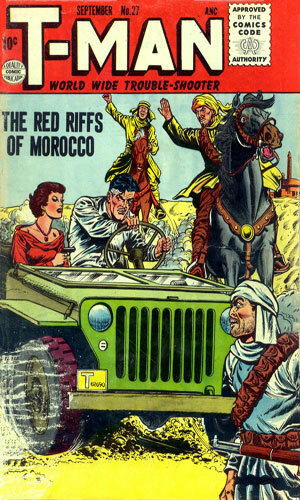 T-Man Comics #1 - second story - A baron and baroness have stolen a vital American code book and are transporting it via cruise liner back to their home country. T-Man Trask is assigned the job of stealing it back but there is a complication. 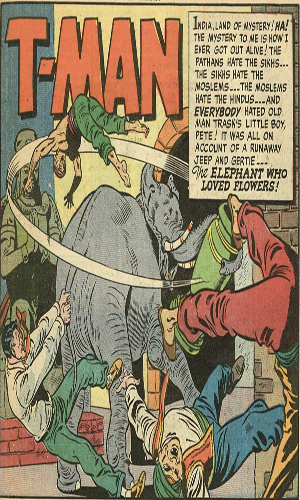 T-Man Comics #1 - third story - In India to find a communist propaganda publisher, T-Man Trask finds an elephant who takes a liking to him. 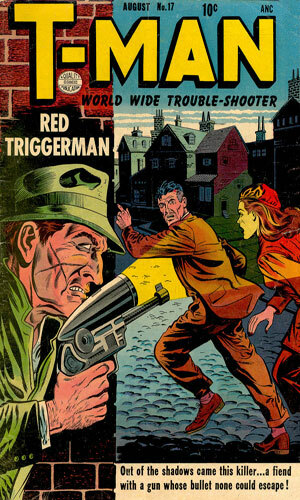 From Police Comics #108 - Asked to help find a communist gang peddling government secrets, T-Man Trask takes the role of a Yank mugger who just "happens" to have nailed a man carrying state secrets. 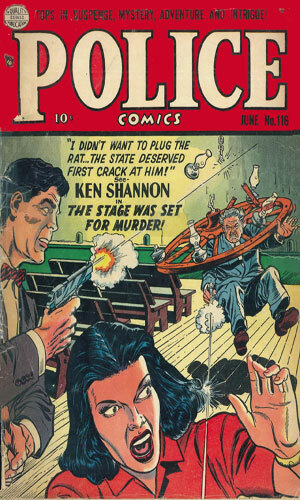 From Police Comics #109 - In Singapore, T-Man Trask finds evidence of a communist plan underway on an atoll near the nuclear test site of Bikini, using a special device to learn secrets from the radiation of test explosions. T-Man Comics #2 - lead story - A formula for a powerful new non-nuclear explosive, known as Explosive X, has been stolen by a Chinese lab assistant who then boards a freighter to the Far East. T-Man Trask must parachute onto the vessel to get it back. 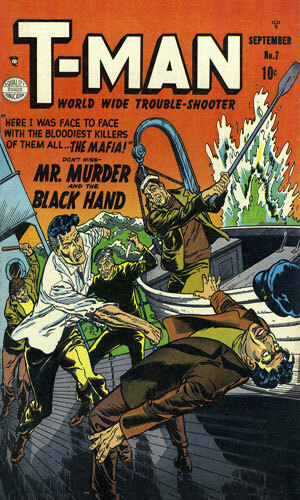 Reprinted in T-Man #30 and Men of Mystery #73, both with slight title change. 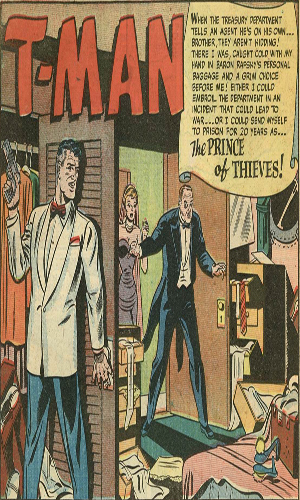 T-Man Comics #2 - second story - Knowing a professional smuggler was bringing diamonds illegally into the US and proving it was murder but T-Man Trask followed such a man to Havana to do just that. 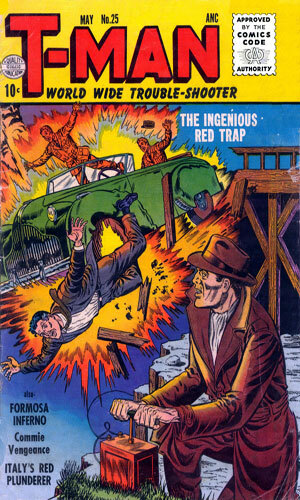 Reprinted in T-Man # 34 and Horwitz's T-Man #1 with name changed to Musical Menace. T-Man Comics #2 - third story - A mysterious kingpin of secret smuggling is recruiting traveling salesmen all over Europe to be his illegal couriers. T-Man Trask goes undercover as one to track him down in Lisbon. 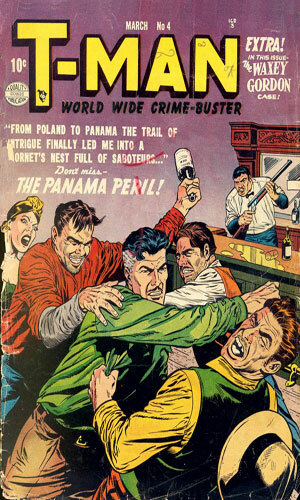 From Police Comics #110 - An emerald smuggler in Brazil escapes T-Man Trask and heads to the States but Trask won't give up the chase. 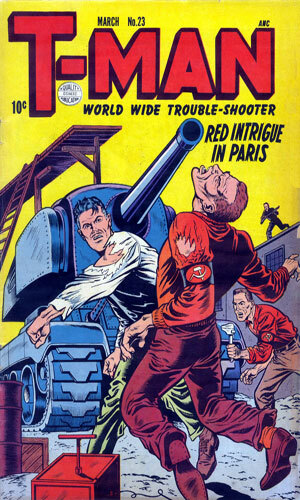 From Police Comics #111 - In Paris, a communist agent is recruiting local hoodlums to carry out assassinations of high-level officials and T-Man Trask goes undercover to be so recruited. 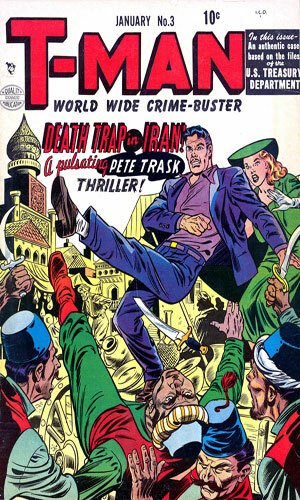 T-Man Comics #3 - lead story - To keep Iran from signing a trade pact with the West, Soviet agents bring in a ringer - a man who looks a lot like T-Man Trask to generate ill feelings. 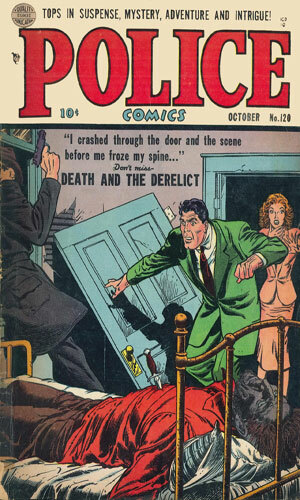 Reprinted in T-Man #31 and Men of Mystery #55 though with a couple of pages removed. 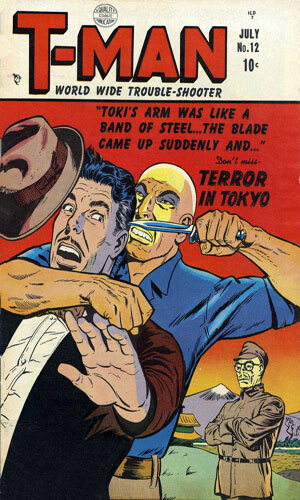 T-Man Comics #3 - second story - Trask is on a cruise ship in the South Pacific to capture a Soviet spy when the ship collides with a Russian sub ready to test a new weapons system. 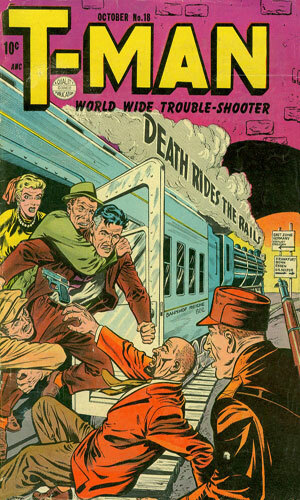 T-Man Comics #3 - third story - A train derailment in the Alps has caused problems in the delivery of a briefcase containing vital information. 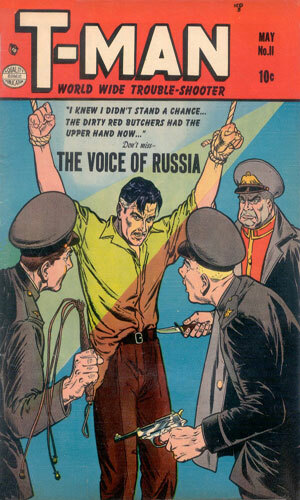 Trask's job is to get it before the Soviets do. 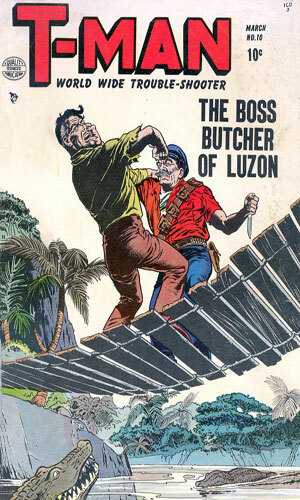 Reprinted in T-Man #33 and Horwitz's T-Man #1. 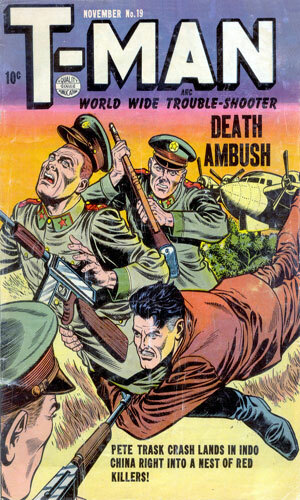 From Police Comics #112 - In North Korea, the enemy is using a revolutionary radio-controlled tank in the Conflict. One of the tanks is captured but it is the job of T-Man Trask to go deeper into enemy territory to nab the inventor. 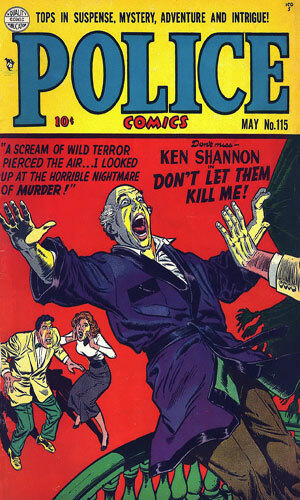 From Police Comics #113 - A grain shipment to the famine nation of Ranjab is being threatened by a mysterious entity known only as the Devil's Agent and Trask's job is to make sure the goods get to their proper destination. 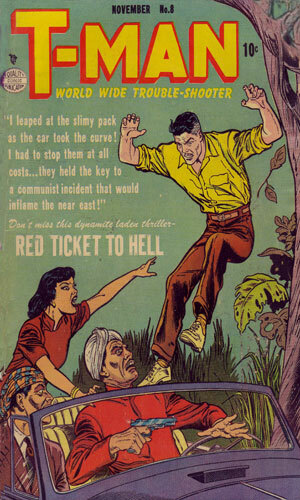 T-Man Comics #4 - lead story - A T-Man was killed trying to get word out about 'Anita' and a 'Canal' attack. Trask soon learns it deals with a Soviet attack to blow up the Panama Canal. 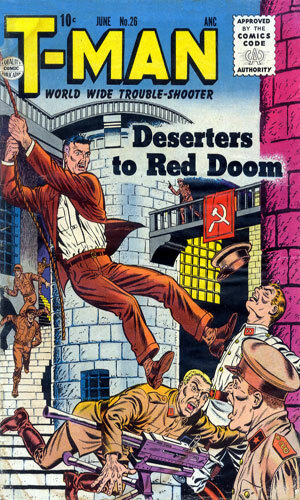 T-Man Comics #4 - second story - The body in this mission is that of Pete Trask as he is in Spain to find the soviet agents who killed the Treasury agent in that city. 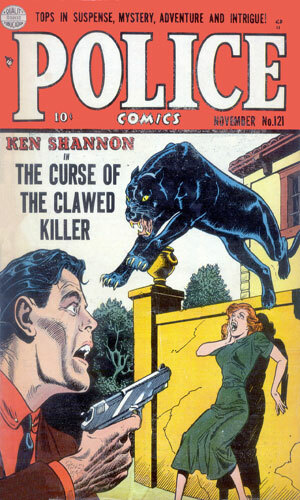 From Police Comics #114 - In the jungles of Kenya Pete Trask watches a communist spy be slipped a small package. When Trask takes it from him, he finds it only has seeds. A local botanist discovers it is from a man-eating plant. 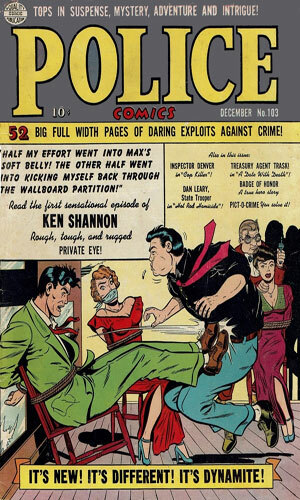 From Police Comics #115 - Chasing a highly skilled counterfeiter, T-Man Trask heads to Tijuana but comes up against a lot more trouble than just one talented engraver. 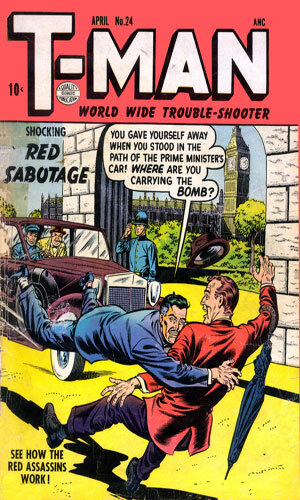 74 The Plot To Blow Up The U.S.A.
Well! A Treasury agent was not what I figured would be added to the compendium. I mean, they serve the public and carry a badge and fight many different types of bad guys. But the same thing that keeps me from adding tons of series about FBI agents was the same thing that made me hesitate on this one. Either the character is a member of a spy organization or he/she is normally involved in international intrigue. Those were my starting guidelines and for the most part I have stuck to that. And I think I still am with T-Man Pete Trask. Trask is a Treasury agent and he does go up against the normal bad guys you would think he would - counterfeiters and the like. 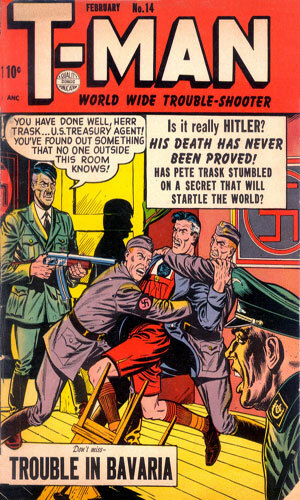 He also travels, well, everywhere and is constantly out to stop Communist agents who invariably cross paths with him. If he had operated when they gave out frequent flyer miles, he would have racked up a ton. But then the trips would likely just take him to where the government was already sending him and vacation or not, someone would certainly decide to shoot at him or throw a knife or heave a bomb or, at the very least, conk him on the head. That's just the way things go for Trask. I liked the series a lot. Trask has a sense of humor. He thinks a bit more of himself than he probably should but since he gets himself out of all the scrapes he gets himself into, maybe he has a right. Fun series with lots and lots of adventures.